Larry Madowo is currently the biggest name in Kenya's TV presenters world, and his talk show 'The Trend' is a Kenyan version of the Steve Harvey show. But with all the fame and of cause money flowing into his pocket, Larry is nothing but an a presenter from Africa when it comes to global media world, there are big names out there and Madowo had an opportunity to meet one of them when he attended the Mobile World Congress in Barcelona. He had a rare opportunity to meet with Richard Quest of CNN and even got to take a selfie with him. 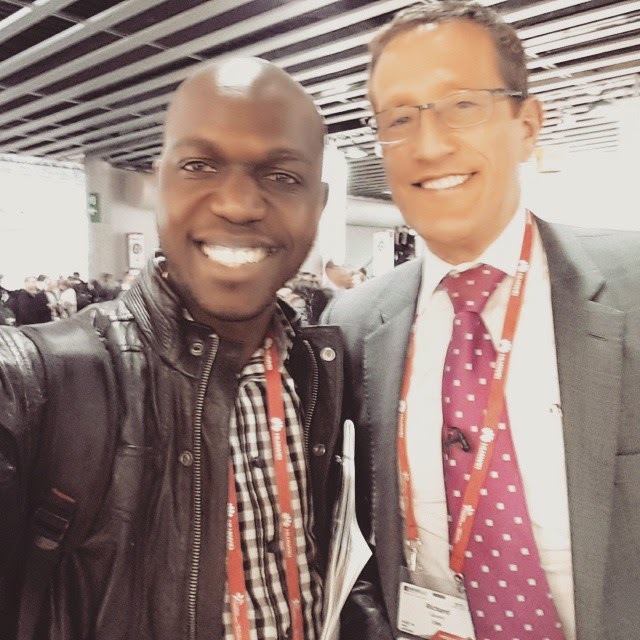 Larry Madowo was shocked to find out how humble Richard Quest is, even with all the fame and every one surrounding him, he couldn't turn away a request to take a Selfie with an unknown TV presenter from Africa - Larry. Richard Austin Quest is a top CNN journalist who is based in New York City and his show 'Quest Means Business' is watch by millions around the world. Here is Larry with Quest. He cationed: "I just ran into Mr Business himself Richard Quest in Barcelona. Top dude"